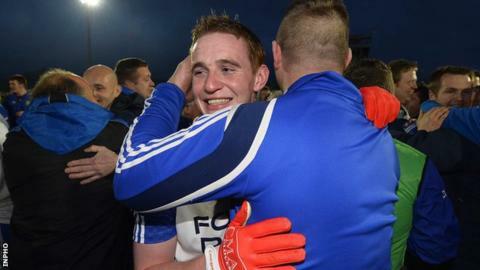 Ballinderry and Derry forward Aaron Devlin is on life support in hospital after contracting meningitis. His club has called on all its members to pray for the Devlin family at "this awful time". "Doctors have said that the next 24 hours will be very, very vital for Aaron," Ballinderry club official Adrian McGuckin told BBC Radio Foyle. Hundreds of messages of support and prayers have come in for the talented half-forward. Devlin, 22, also played for the University of Ulster Jordanstown, which said its "thoughts and prayers are with Aaron and his family at this sad time". The Ballinderry club expressed thanks for the many messages of support and said that they were "much appreciated". Devlin, who recently qualified as a physiotherapist, was taken to Antrim Area Hospital on Friday two days after playing a challenge game for his club. The Derry county forward played for only 40 minutes of the game, citing tiredness for his decision to come off. The player's brothers Colin and Ronan have also represented Derry footballers at senior level.